It is with great joy that we announce our newest male addition to the KotyKatz breeding program! This VERY handsome rosetted silver boy comes to us from our friend Jamie at Naples Bengals. We thank her so much for the opportunity to add him to our breeding program! Calusa will be the perfect match for all of our girls with new diverse bloodlines. His genetics will allow us to continue our pursuit of the perfect silver lynx points and charcoals. Already can’t wait to see his first babies! If you’d like to see Calusa’s pedigree, please click here. 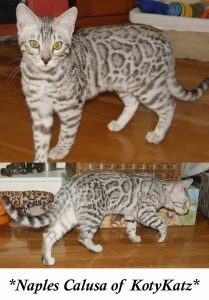 This entry was posted in Gallery, Up and Coming Studs and tagged bengal stud, Calusa, silver rosetted. Bookmark the permalink.